Good things come in small packages, well, unless you’re a cruise ship that is, and then good things come in a large, extra-large and a jumbo package. But while some cruise ships are immense, and others slightly smaller in stature, the line still brands them with their own unique touches, making any cruise a fabulous vacation experience. Norwegian cruise ships are no exception as the class and sparkle shine on through, no matter the size of the vessel. The Norwegian Cruise Line Epic is their largest and most innovative ship to date, with a capacity for over 4,000 passengers and an impressive destination list, including transatlantic sailings. Of course with being so large she has the room for more cabins than her smaller sisters, including the 2 bedroom family villa part of the Haven group of rooms that accommodates a family comfortably with room to spare. 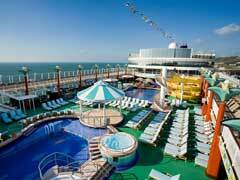 The widely acclaimed Blue Man Group performs on this ship, and there are dining options, bars and activities galore. Norwegian cruise ships that are slightly smaller include those in the Jewel class, including the Norwegian Cruise Line Pearl and her sister, the Norwegian Cruise Line Jewel. Both of these ships are smaller than the Epic, with both having a capacity for just over 2,300 passengers and both coming in about 100’ shorter than their larger sister ship. Although these ships are roughly the same size, they are still different from each other in their onboard restaurants, shows and bars. The themes are different onboard so you will have a different vacation experience on both. The Jewel sails to Alaska, the Bahamas, Florida, the Caribbean, the Pacific coast and the Panama Canal, while the Pearl also goes to Alaska as well as points in the Caribbean and Mexico. At a tad smaller than the Jewel Class is the Norwegian Cruise Line Spirit, coming in at 881’ and able to carry just over 2,000 passengers. She has 14 dining options, down from the 16 of her larger sisters (and the 21 of the Epic!) and things like the Trivoli pool, Maharajah’s Casino and the Beir Garten Grill, along with the Galaxy of the Stars observation lounge. Norwegian cruise ships make sure to make a splash and are individualized to make each an interesting place to explore, even within the same class, the differences are obvious. Norwegian cruise line deals can be had on many sailings throughout the year, so check with your travel agent or online for the best deal for your particular sailing. Norwegian cruise ships make the effort to make every vacation a memorable experience, and that is before you even set sail!